Two cold wintry days in the middle of January on Dartmoor gave us a wonderful interlude at a busy time and a much-appreciated rest. The weather changed so quickly that we experienced a glorious sunset, stunning views of snow-covered moors and slopes of the tors, wide glassy rivers snaking across the white wilderness and an oppressive mist which shrouded all the terrain with a grey cloak. A few small herds of sheep and cattle were braving the wet, wintry conditions on the moors and ponies were grazing at two of our stopping places. 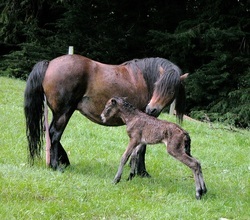 ​As the sun began to set a fleeting incident between a mare and her foal caught my attention. We had just enjoyed two apples and I threw the core out to the mare. The foal inched forward to sniff at one of the cores and nudged at it with his nose. There was a blur of wings and the core was snatched away by a crow. The greedy thief perched himself a few feet away on a small rock and shredded his tasty find with his long, vicious beak. My instinctive reaction was one of sadness. I chided myself for being a little bit too involved with the incident. The sadness quickly evaporated when the mare picked up the second core for herself. At least one of these horses would be able to enjoy one of the apple cores. Imagine my amazement when the mare passed the core to her foal who thoroughly enjoyed his second chance at tasting, possibly for the first time in his life, an apple core. This touching scene, albeit between two horses, reminded me of the tender, loving care a mother gives her child. as well as the enormous gap in someone’s life should this be lacking. Of course, other family members can all be part of this care too. Did your mum run to protect you when those school friends or bullies had a go at you, or want to rush into class situations to let the teacher know when you were unjustifiably accused of doing or saying something that you shouldn’t have? How many times did she make excuses for you when you rightly deserved to get into trouble? Did she come under fire herself, as it were, because of some of the scrapes that you got into? Were there occasions when she went the extra mile to make sure you did not miss out, or so feel for you that she made up for your disappointments? Those are the things we remember of a good mother. Can we ever replace that TLC that our mum gave us? Mum did her best with what she could. I came to the conclusion that the ability to offer TLC can be our own quest. Not of all of us can give such a glowing picture of our mum. It might not have been her fault that she could not be what she could have been. We can, though, reverse the trend. Whatever state we find ourselves in, single or married, we can become the best at TLC. We can give something of ourselves that shows someone that we care. Not only do we care but we will do something practical to show that we care. We might not have a mother’s touch but all have the capacity to care. The ability to care does not depend on gender. We all can become proficient at being a caring supportive individual. To care is to prefer someone else’s needs before my own. In other words, kindness and sharing are better than selfishness and greed.